As a reader, the idea of getting books for free sounds great! Who doesn’t like free? I remember as a child, being completely AMAZED when I went into my very first used book store. They weren’t free, but trading in my old books made them seem free. I didn’t ever have to use my money! So… free. It was called The Book Rack and I begged to go several times a week. My biggest regret was not realizing that when I turned in my old books to get credit for new books, I didn’t get them back. AND in the end, the number of books I owned went DOWN. Seems logical, but to a fourth grader, I just didn’t quite get it. As an adult, I now know that there is a cost for everything, EVEN for free. I actually learned this lesson as a teenager when I went to Nature Camp. One of the big lessons we learned in terms of conservation and the way that the natural works is that there is no such thing as a free lunch. AND that this didn’t apply to eating food! When a bear ate a fish, that cost the fish its life. When someone chops down a tree to use it for firewood, there is an impact on the creatures who lived in the tree or maybe even the smaller vegetation growing in the shade of the tree. Everything has a cost. I am a big-time bargain shopper, especially when it comes to books. When I see cheap or free books, I get super excited! But, like the no-free-lunch rule, there is no such thing as a FREE BOOK. 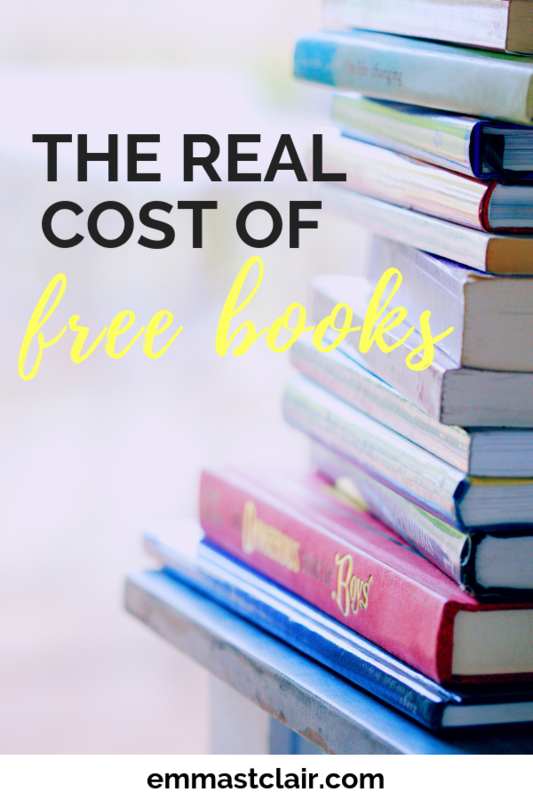 As an author, I thought I’d share a bit of what goes on behind the curtain when it comes to a free book and what that cost REALLY is. First, I’m going to break down what it costs a self-published author to write a book. These are just the basics! You might also end up with costs like childcare or coffee (if your writing “office” is not at home). A lot of these costs may vary, but for one of my books, the basic costs are at least $500. There are also costs that aren’t strictly financial and harder to measure. I get joy from writing, but it can also be emotionally exhausting. It does take a lot of my time. For different authors, the amount of time it takes to write a book varies. But realize that there are HOURS going into every book. And these are not hours where we are getting an hourly wage, since that’s not how we get paid. Now let’s breakdown how pricing works for books to see how authors get paid. For traditionally published authors, they will typically get an advance against royalties. That means if they get $5000 up front to write a book, they won’t get any more money unless the book sales go ABOVE that amount. The agent will get 15% of the advance and of any royalty. If the author sells enough books above the advance to get royalties, they will receive somewhere between 10-15% of the list price of the book, maybe less for trade paperbacks. (Read this post if you want details on royalty rates!) They pay their agent 15% of those royalties. So on a $20 book, the author might earn $2.00, then have to pay the agent out of that. When I launch a book at 99 cents on Amazon, I am earning somewhere around 30 cents per ebook. Think about this for just a moment. For all those hours, all that time, all those costs, authors are earning 30 cents per ebook sold at 99 cents. When I first started writing, that number made me feel sick. I value my books. I want to write quality. It’s not even just about how much I’m paying out of pocket to write a book, but how I value my work. As a reader, I love bargains. We have five kids and aren’t living on some giant income here, so we don’t have an unlimited budget for books. But as an author, I know how much other authors are making when their books are priced low. I want to value their work as well and to pay them a fair wage. If authors are putting $500 into writing a book, you might be wondering why they would ever sell a book at 99 cents or free. Usually it has to do with marketing strategies, which is probably way too boring and intense to get into here. But in short, pricing books lower for a time allows authors to get visibility. At a lower price point (or free), authors can utilize promotional sites that will help get the word out about books on sale. (These are usually paid sites, so they factor into my marketing and advertising costs.) When books are selling more, they show up higher on the bestseller lists in categories on Amazon, which get them in front of more people. Free books through sites like Bookfunnel can also be a way to help an author grow an email list. Readers exchange their email for an ebook or a sample. Then the author will have the ability to email that reader about future books and sales. So offering free books is generally a way that authors can be discovered by new readers, who will hopefully become readers who buy books. Authors get paid by page reads, a percentage that Amazon changes every month. As a romance writer, a lot of readers use KU and 85% of my income comes from KU page reads. For a book priced at 99 cents, I will usually make more money if someone reads my book through KU. But this depends on the length of my book and the page read payout for the month. I wanted to write this post because I think it’s good for readers to understand what goes into the writing and how authors get paid. No, it won’t increase your book budget, unfortunately. But I hope it helps you understand a little about the business of publishing and how authors get paid. Every week I get a few emails from readers requesting free copies of print or ebooks. Sometimes I get emails saying that my books at $3.99 are priced too high. Usually the reason is that people are on a fixed budget. I get it! This past year, my husband has been between jobs. We don’t have a big book budget either! I have a Kindle Unlimited subscription ($9.99 a month) and we buy paperbacks at places like the Goodwill. So I very much understand book budgets!! But look at the flip side: This past year, my income from writing has helped pay our mortgage and bills. If I’m giving away all my books for free or keeping them at 99 cents, that means a lower income for our family of seven. I can’t imagine going into a business of any kind and asking for a discount or free product because I can’t afford it. Am I looking for pity or trying to be manipulative to readers?? NO WAY! I am so happy to be in a time where I can write and publish my own books. I love knowing that people are reading my words! This past year, I’ve started making a full-time income which has helped since my husband was between full-time jobs. Doing something I love AND making money? This author gig is a dream come true! But it’s also a LOT of work. My books are all in KU, which means that if you have the means to pay $9.99 a month, you can choose to read my books and thousands of others for free. I also usually launch new books at 99 cents or at least have that price for a limited time. At full-price, my books are still less than the cost of a Frappuccino at Starbucks. I hope that this post helps you understand a little of what goes into writing and publishing a book and how authors get paid! I value my books and want to put out the best product I can. I also value my readers and hope to have options even for people on a budget. And if you ever thought about asking a writer for free copies (this is NOT most of you!! ), consider the value of books and the cost to the author. I’m happy to hear KU is worth more than I thought. I read multiple books a week in KU which makes it a great deal for me. I had hoped it paid the author fairly. I suppose it does as long as the book is read all the way through. I will start making sure I go though the last pages (up and coming books and thanks etc) too. What an awesome post, Emma! I know what you mean as I’m also an author who has books up for sale. I do know what it’s like to feel books are priced too high. Several authors I know personally are published by better known publishers and New York publishers and I’ve had to stop buying their books – I’m not able or willing to pay over $10 dollars for an ebook – but I feel badly all the same that I’m no longer able to help their careers. Your prices are very reasonable. You’re doing it right.